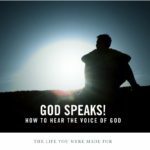 Is it hard for you to hear God’s voice? We’ve all struggled with this at some point. But God promised that we could hear his voice. So why is he sometimes so hard to hear? Click on the video and learn the five blocks to hearing God’s voice. What was the key in your life to hearing God’s voice? Just leave your comments in the box below. Have you tried to hear from God but heard nothing? And even if God was speaking to you, how would you know it was him? If you are his child, he’s speaking to you. You just need to learn how to recognize his voice. And when you do it will change your life. With this five part video series, you will learn how to hear God’s voice and then step into a new conversational relationship with him. I have found that I hear God speak to me most through reading scripture, and then He nudges my spirit at certain passages to understand what He is saying to me personally through them. I have found it difficult to hear the voice of God or to discern His leading just in prayer, maybe because I have a very active imagination and think a lot… it’s very hard to know what is God and what is just my own thoughts or other influences. I am sure I was hearing from God and just not recognizing his voice. A turning point for me was when he very clearly confirmed what I had heard for another person; there was absolutely no other way I could have known that detail of her life if he hadn’t revealed it to me. He allowed me to see the truth to encourage me that I can and do hear his voice. This was a breakthrough point for me in trusting when I sense He might be speaking to me. I really encourage others to listen to Grant’s teaching series “God speaks” as it’s very helpful. Mark has workbooks, resources and he comes to Toronto to teach at Catch the Fire church, I think. Yes, I heard Mark Virkler at CTF and he helped me get started hearing God’s voice. I’ve used his materials in my own video series.